Our Blog site has moved to our main website. We are now located under http://www.frayededgeconcepts.com. The move made more sense and everything will be in one place! YAY! We want you to still visit and interact with us, so if you view our work, leave us a comment. We appreciate it when people stop by and make it personal. Thanks for all the love and being there while we made this transition. We’ll be updating the blog regularly, so hop on board and join us every chance you get! Vanessa and Stephen are a super duper, fun-loving couple with a passion for life so big it’s hard to be around them and not want to smile–A LOT! So when it came time to plan their session, they wanted their images to incorporate a few of the activities they enjoy together. 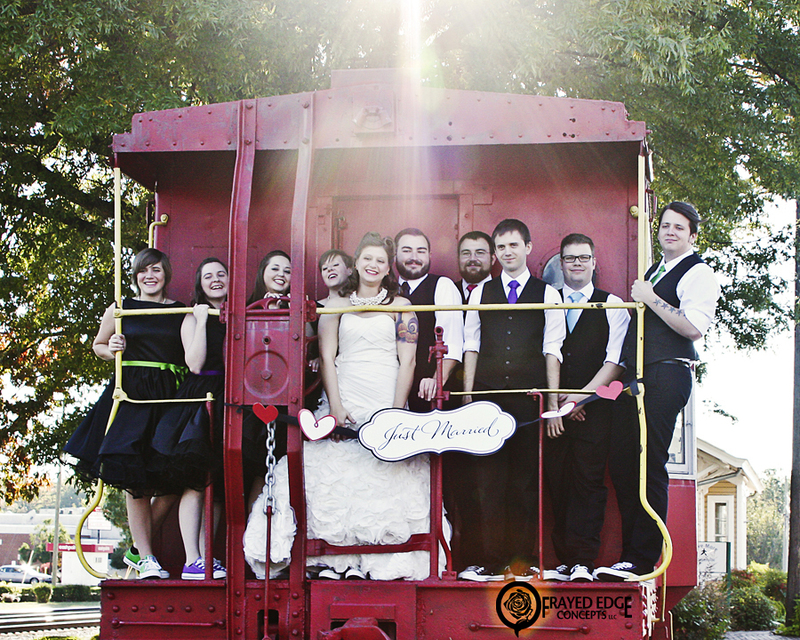 Their E-session included walking the dogs, picnicking, hula-hooping, playing guitars and rowing. After such a fun session like this, Frayed Edge can’t wait to see what’s in store when we shoot Vanessa’s bridals in the fall and their wedding in November. I asked Vanessa to share how she and Stephen met. Their story below is just as much fun as they are! Our first date was in downtown Greensboro, January 2nd, 2009. It was freezing but it was beautiful since the ginormous Christmas tree was still up in Center City Park. We ate tapas at a restaurant that I don’t think is there anymore; Steve impressed me when he agreed to order dessert and share it. Dessert- quite high on the approval scale for me (Life’s short…….eat dessert 1st). Then we walked a short distance to an improv show called THE IDIOT BOX, which is kind of like the old show “Who’s Line is it Anyway”. Singles take note: laughter- ALWAYS great for a 1st date! Then we had beers and talked at McCoul’s for several hours. We closed the place down, and ended the night with some late night pizza just down the road. Stephen was a gentleman and gave me his new wool coat to wear when he realized my sweater wasn’t enough to keep me warm. DeAnna’s Senior Session took place on her grandfather’s beautiful farm in Randolph County. DeAnna comes from a very close knit family, so she wanted a few of her photos to highlight her special relationship with her parents. 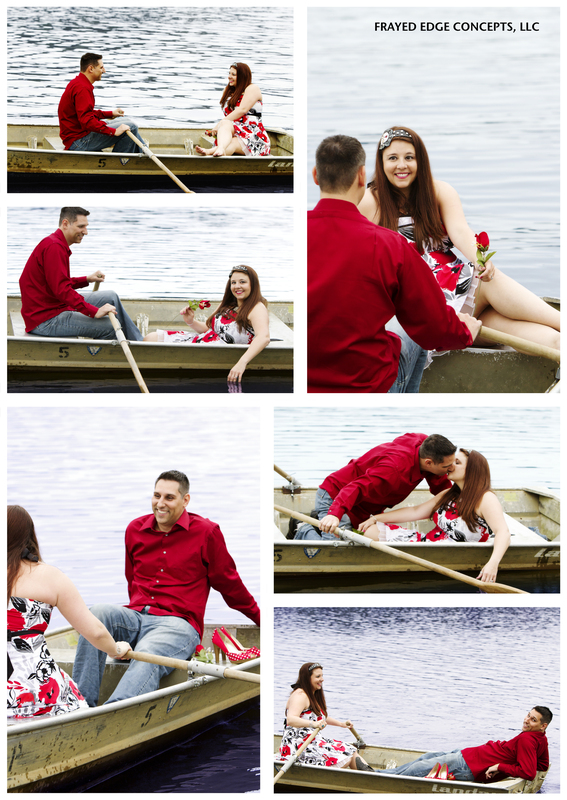 She also wanted a couple of fun shots with her boyfriend, since he’s been such a big part of her senior year as well. Her dog, Crystal, was such a photo diva, she seemed to enjoy the shoot as much as the rest of us. 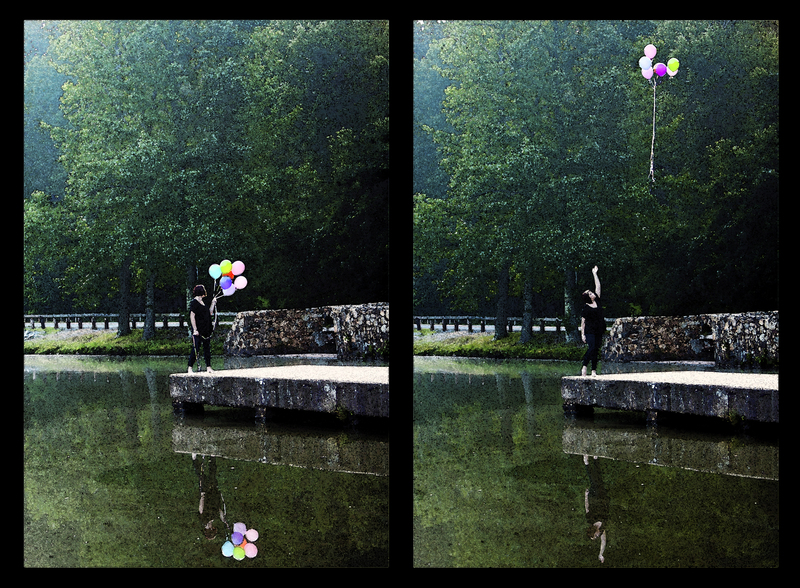 The weather couldn’t have been more cooperative and it turned out to be an amazing shoot! Frayed Edge would like to congratulate DeAnna on her upcoming graduation and wishes her the best on her future endeavors! 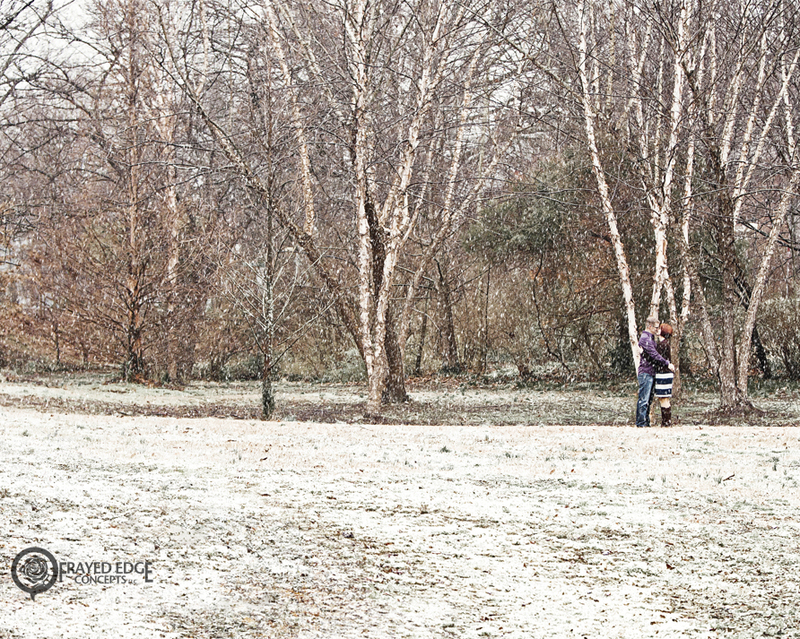 The temps were barely above freezing and a light snow fell intermittently during their E-session, but Alison and Cary never complained once. In fact, at one time in the middle of the session, I heard Alison say, “I’m having so much fun!” I think the images below are a good indication of the fun they were having and also show how relaxed and comfortable they are as a couple. After spending some time shooting in a Greensboro Park we headed over to Natty Greene’s for the couple to warm up with a cup of coffee and a couple of drinks. It was a super fun session and Frayed Edge is looking forward to shooting Alison’s bridal portraits and their wedding in the fall!! So you’ll be seeing more of these two in the future!! We’re trying something new this year and we call it, “FRAMED.” The idea is to work with clients to use photography and graphics to produce a piece of art that compliments a space the client wants to enhance. The cool thing about it is that the client will appear somewhere in the piece, kind of like Alfred Hitchcock appearing in cameo in one of his movies. The client’s presence in the piece can be as conspicuous or as inconspicuous as the client wants. The important thing is that the final piece incorporates the colors, style, story, texture and size the client wants for the space. Contact us from our website if you’re interested in making a cameo above your own mantle piece. This photo session with Dana and her sons was a WINDY one in downtown Greensboro. We still had a bit of color on the trees but it was definitely blustery and extremely cold. Despite the weather, we had a great time and a lot of laughs! Jason and Ted were real sports through it all. Thanks, guys!! 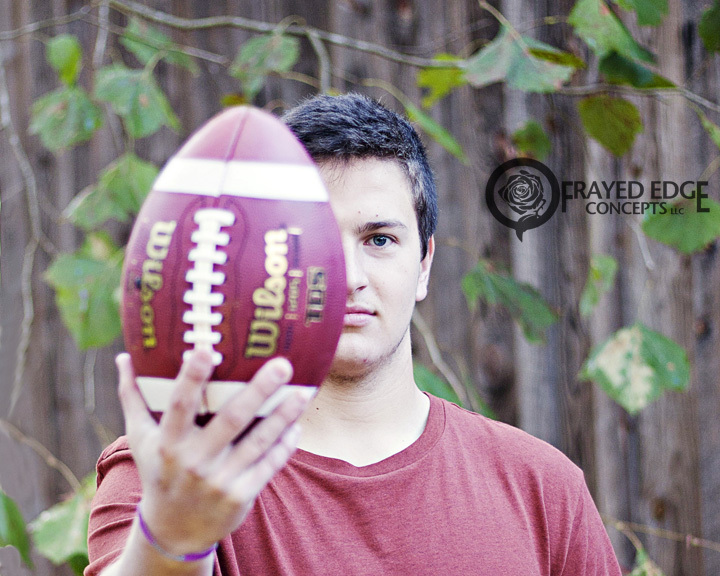 This 6’2″ senior is an outstanding tight end and linebacker for his high school football team. He has a lot to smile about since he ended his 2012 season with impressive stats. We have no doubt that his college football experience will bring him much success as well! Frayed Edge wishes him the best as he pursues his goals in the upcoming year!